Maischloß. Another scary sequential movement puzzle from Jean Claude Constantin that will surely keep you busy for a long time. 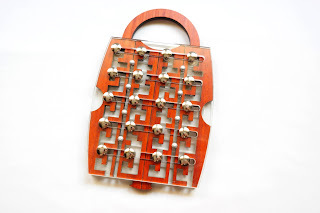 Can you open this extremely difficult Puzzle Lock? As you can see from the photo, this is quite a big puzzle, considering that other puzzle locks are usually smaller. It measures 18cm x 11.5cm, which is rather satisfying for a puzzle that looks so stunning and intriguing at the same time. 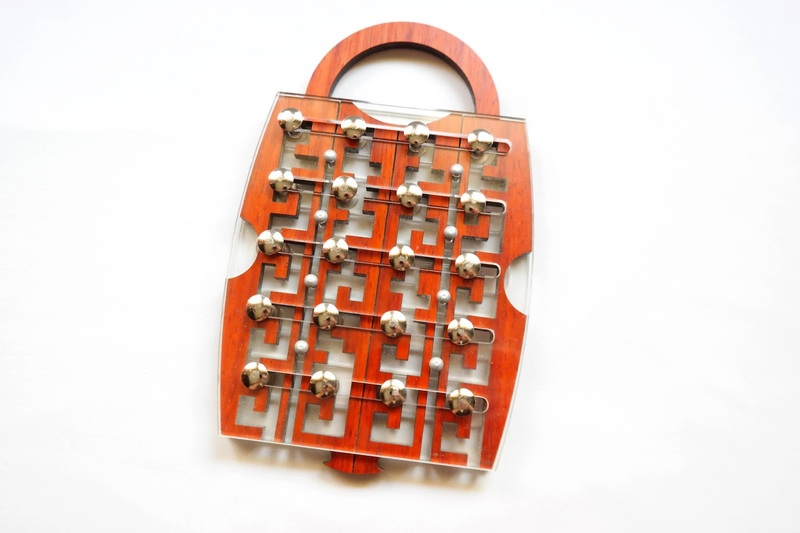 This lock consists of 20 pins - five groups of four - and each group of pins moves left or right. The pins don't move independently from each other, instead they move simultaneously within each group. The design of the puzzle is what's most striking about it. It's made to look so complex that it will certainly intimidate even the most experienced puzzler. There are four different rectangular mazes in the form of sliding platforms that the groups of pins need to navigate. When you want to make a move you need to make sure all pins aren't blocking your movements. The two middle platforms are the most important since they're the ones that will be first removed. Only when they're out of the puzzle will you finally be able to remove the last two platforms, which are connected to the shackle. The platforms move vertically, which is perpendicular to the movement of the pins. This is an extremely difficult puzzle to solve, a level 10/10, so only if you feel confident you can solve it should you attempt to do it. A beginner will most certainly feel frustrated in no time. This looks like one of those n-ary puzzles Constantin also makes very well (a binary puzzle for example), but this is not one of those. In fact, I believe that because it's not a n-ary puzzle it's even more difficult, because its sequence is not linear. It's more chaotic and it doesn't follow any specific rules. You will need to solve it step by step by always figuring out the next move, not by a predetermined sequence but by a random set of movements - like a maze! We all know that mazes aren't logic, so just keep trying until you can open the lock. If you like difficult puzzles, Constantin has so many great ones for you that it will be difficult to choose just one. The Maischloß is a great choice if you're looking for a good challenge and a different concept. It has all the ingredients an experienced puzzler wants. Availability: You can get a copy of the Maischloß puzzle at Brilliant Puzzles for $38.95. For more Constantin puzzles check out their other offerings.